Today on Tex and the City: A good cause reinforces Jon Paul’s love of hard covers over e-books. Guest stars: Daisy Martinez, Patti LuPone (sort of). Last night, in the midst of a passionate Upper West Side crowd, Patti LuPone was staring at me with an eager, come hither grin. As I approached, a cutish guy caught my eye, “You’re the first one to show interest all night.” He was one of the volunteer’s at the Goddard Riverside Community Center 24th Annual New York Book Fair. 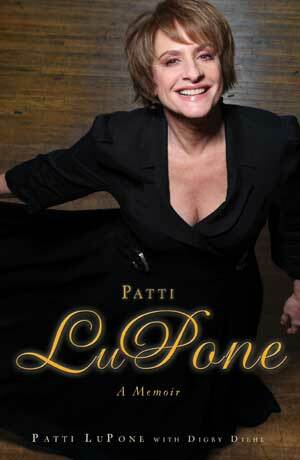 And unlike celebrity chef Daisy Martinez who was signing books in-person across the room, Patti had sent a facsimile of herself courtesy of the cover of her book, Patti LuPone: A Memoir. What must have the contentious discussions been like to come up with that clever title? Still, after a product plug on Glee from the impossibly precious Blaine, I couldn’t resist taking a peek inside. After all, it was for a good cause. Every year the weekend before Thanksgiving, the Goddard Center hosts this fundraising fair featuring 50% off some of the latest and most buzzed about books donated by various publishing companies. And I can see why they participate every year. The Goddard Center is an outstanding organization with 27 programs in 21 sites on the Upper West Side and in West Harlem focusing on children, youth and families; homeless people; older adults; and advocacy and tenant assistance. Thanks to the Whole Foods Market Upper West Side sponsorship of the event, Chef scored me a pass to the gala preview where I shopped for best sellers without breaking the bank. For Chef, I elbowed my way through the Cooking section picking up Thomas Keller’s Ad Hoc at Home and Bouchon at way under market value, while cautioning other buyers that his French Laundry cookbook was really only for the extremely seriously trained culinary professionals. For myself, I grabbed Mark Bittman’s latest The Food Matters Cook Book. In the Hot Titles section, I nearly tackled someone to pick up a hard cover cop of Jonathan Franzen’s Freedom, even though I just ordered it on Kindle. I’m still having trouble getting my head around reading “important” novels in electronic form. I have the same issues about wanting to have real copies of “quirky” books, which is why I probably nabbed John Waters’ Role Models. Super Freakonomics, on the other hand, is a book I would happily read electronically, but not economist-turned-Chef, so I caved for him. 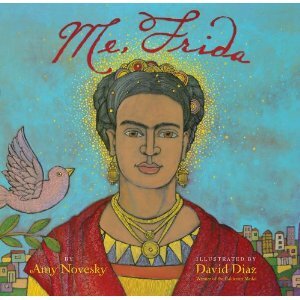 We even picked a Christmas present for our nieces, a sweet children’s book Me, Frida about Frida Kahlo finding herself and following her dream when she moved to San Francisco with Diego. The book jacket says the book “encourages young readers to believe in themselves so they can make their own dreams soar.” Hmm, maybe I’ll hang onto it. Back at the Entertainment section, I was just putting down Patti’s book, not too impressed with the over-the-top self-congratulatory opening. Then the Goddard Center Broadway Babies took the “stage” and belted out “Give My Regards to Broadway.” It was a Glee-come-true, and I decided that Patti should come home with me. On the subway lugging home all the heavy purchases, I couldn’t thinking about Kindle—hoping e-book craze never puts this cause out-of-business. Today on Alphabet City: Jon Paul suffers real reading glitches when Kindle goes on fritz. A few weeks ago, maybe closer to a month now, my Kindle broke. My lackadaisical memory of the exact date of Kindle’s passing should be a telling clue that I’m not all that torn up about the loss. The Kindle and I always had an awkward relationship. Angela gave it to me as a present for my 40th birthday dragging me into the modern era of e-books. At first, I found Kindle useful in some situations—last minute instant purchase of Kathy Griffin’s autobiography was the perfect poolside vacation read. But slowly, Kindle started making me nervous. I eyed flight attendants suspiciously hoping they wouldn’t make me switch it off on the runway, forced to flip through the SkyMall catalogue again. Sometimes, I wouldn’t even display Kindle on my subway commute because someone invariably asked me, “Do you LOVE your Kindle?” That’s an awfully strong verb to use for an inanimate object. Over time, I purchased certain types of books for Kindle—ones like Andre Agassi’s memoir, not likely to be shared with, or even interest, Chef. Or runaway bestsellers that I happily hid on the Kindle, not wanting to broadcast that I’m a sucker for good marketing. The Help comes to mind—although I’ve now recommended that book widely. “If the Kindle breaks do you lose your library?” Chef asked early on—not because he’s a Technology Chicken Little, but because he’s spilled coffee cups near laptops enough times to make us both nervous. “The books exist not just on the Kindle, but in Amazon land somewhere. Like a back-up,” I replied nonchalantly. I wasn’t too worried about what would happen should the technology fail because I purchased Kindle books to which I didn’t have a strong emotional connection. And then it happened—Kindle went on the fritz while visiting Angela in Woodstock. One quick call to Amazon confirmed the device was beyond repair—and a week out of warranty, of course—and that it could be replaced for $150+. I shrugged it off, said I would give it some thought, and shoved the Kindle into a drawer filled with techno paraphenalia that time forgot—old Blackberry chargers, a now vintage Palm device, some Apple cords for laptops gone by. “Real books don’t suffer technology failures,” I told Chef, as I packed for the Alphabet City tour. Since I would be visiting indie bookstores around the country, I vowed to support them by purchasing printed books while on the road. In Philadelphia, at the famed Giovanni’s Room, I picked up a copy of Eric Poole’s funny memoir Where’s My Wand? about his life as a kid believing he had the magical powers of Bewitched. In San Jose, I finally had a moment to crack open the spine and chuckled through the first 24 pages. Then on page 25, I thought the grueling nature of book tour was really getting to me. Was that the title page repeating where page 25 should be? Next page was the library of Congress info. Flipping several more pages and it hit me—the entire first 24 pages of the book repeated—in the middle of a chapter. Don’t panic. These things happen. I’m sure it just picks up again with page 25 after the misprint. Nope. Page 57. The book was missing what seemed to be a critical 30+ pages. I couldn’t go on. No quick call was going to solve this dilemma. I wasn’t planning on heading back to Philadelphia anytime soon. And I didn’t think it fair to lie to Borders to score a replacement. Not really the author’s fault. And the title page offered little help with an undecipherable mishmash of companies listed: Amy Einhorn Books published by G.P. Putnam’s Sons a member of Penguin Group. Hmmm. After tooling around online, I finally registered a note on the Penguin website and opened “Incident #100624-000251.” We’ll see how that works out for me. With all the drama unfolding in the publishing world, somehow I’m not convinced my misprint will make the top-of-the-list. For a few days, Where’s My Wand? has been eyeing me longingly from the bedside table. I wish I could just twinkle my nose and fix a technical glitch I never expected from a printed book. But unlike my brokeback e-reader, there’s something about the book’s hiccup that makes me love it even more. It won’t be joining Kindle in the land of the technology misfits anytime soon. UPDATE 6/29/10 3:00PM: The helpful folks at Penguin’s online trouble-shooting department emailed me to say that a new complimentary version of Where’s My Wand? is on the way. There’s hope for printed books after all! Where in the World is Alphabet City? Today on Alphabet City: Jon Paul unleashes his inner game show host (or puzzle master) potentially giving a way fabulous prizes and merchandise. 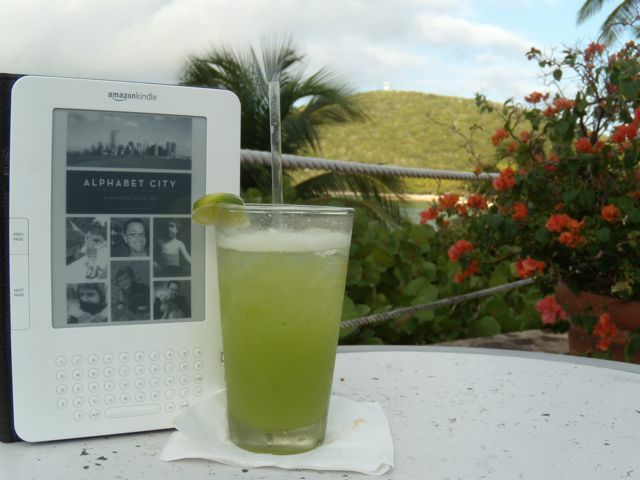 Where in the world is the Kindle edition of Alphabet City posing by the Tanqueray cocktail? Alright readers, get ready to play everyone’s new favorite Blog-a-Game-Show Where in the World is Alphabet City? As I get ready to travel the world country on the coast-to-coast Book Club Party Tour, I decided to launch a quirky little puzzle. I’ll post pictures of Alphabet City: My So-Called Sitcom Life in semi-iconic locales and provide a few clues to the spot. Those that guess-post correctly will be chosen at random to win some kind of (hopefully fabulous) prize. Let’s get started. The first picture of the Amazon Kindle edition of the book is in a spot that actually has nothing to do with my book tour—but it’s exotic and I thought would be a terrific start. While some think of the region as ground zero for rum, I discovered at the resort’s bar this refreshing cocktail called Cool Cucumber (recipe: Tanquerary 10, cucumber juice, lime juice—so smooth and uplifting the perfect pre-and-post tennis beverage). The resort was built in the 1960s by a Rockefeller, and I mentioned its sister property in a post within the past week. For a specially chosen tzotchke from the property, email me by 5pm EST March 16 the name of the resort at nycbucky@gmail.com. Oh, extra points (and possibly an additional prize) for those who have read Alphabet City: My So-Called Sitcom Life and can tell me my connection to Tanqueray. Good luck and good drinking! Today on Alphabet City: An airport security snafu causes JP to reconsider his Kindle love-hate relationship. The TSA agent working the early morning shift at LGA scowled at the monitor of the x-ray belt as my backpack passed through. In a flash, I ran through my standard preparation—emptied out my refillable water container, placed my liquids in a baggie, and put my laptop in a separate bin. The agent shouted at me across the equipment. Great, I knew what was coming next. The question that fellow subway riders always seem to pester me with, “Do you love it?” Because I harbor conflicting feelings about the technology, I don’t have a very good response to that question. And why would the agent be making small talk when there’s a line of folks behind me? Turns out, he wasn’t being chatty catchy. Great, now that terrorists are evidently going to be using e-books as weapons, I’ve got one more thing to worry about at security checkpoints. And frankly, I’m not sure it’s worth it. The problem is that I’ve got my security routine down pat—I’m like a figure skater landing a triple axle. First, I stack 2 grimy gray bins—bottom with computer, top with coat/sweater and bagged liquids. Next, I use my small carry-on placed on the belt to push the trays down the line. And in one last deft move, just moments before everything disappears into the x-ray abyss, I slip off my shoes and place my backpack on the belt. Honestly, it’s such a complicated juggling act that I just don’t see how I could possibly add another element dedicated to the Kindle. Sorry, Kindle enthusiasts, I don’t love the little e-book device that much. I’ve had it for about a year now thanks to Angela who dragged me into the modern era on my 40th birthday. Don’t get me wrong—there are things I really enjoy about it: the ability to instant purchase a book I’d forgotten to secure before vacation (e.g. Andre Agassi’s Open); and, the option to read my copy of The New Yorker electronically because it’s the only Condé Nast publication that can’t seem to find it’s way to my home in Washington Heights. But then there are the Kindle quirks that I can’t stand. Flight attendants have started making me turn it off during interminable runway delays—it evidently counts as an electronic device that interferes with the aircraft. Which means I’ve got to make sure that in addition to the Kindle I have some regular reading material—like a hard copy of that lost New Yorker. See the problem? Then there’s the over-heralded ability to “share” your library with others in your household. I’m not sure Angela is all that interested in my Broadway Queen tell-alls like Arthur Laurents’ Mainly on Directing: Gypsy, West Side Story and Other Musicals or my heavy duty therapy books like Alice Miller’s The Drama of the Gifted Child. Personally, I have no interest in her sTORI Telling or Twilight. Although bless her for downloading Kathy Griffin’s memoir Official Book Club selection which I devoured in Mexico. After a couple of days in Kansas City, I headed back to LGA, nervous about how I would do with effecting proper Kindle handling procedures at security. I was happy to be in a friendly, low-key Midwestern airport rather than the high-pressure Big Apple hubs. Then, with a little encouragement from Susan, I decided to test the system. I left the Kindle in my backpack to see what happened. My normal line-up of bags and trays disappeared into the machine and came out the other side with flying colors. I waited for some kind of comment from the official, but there was no lecture about proper e-book handling procedures. 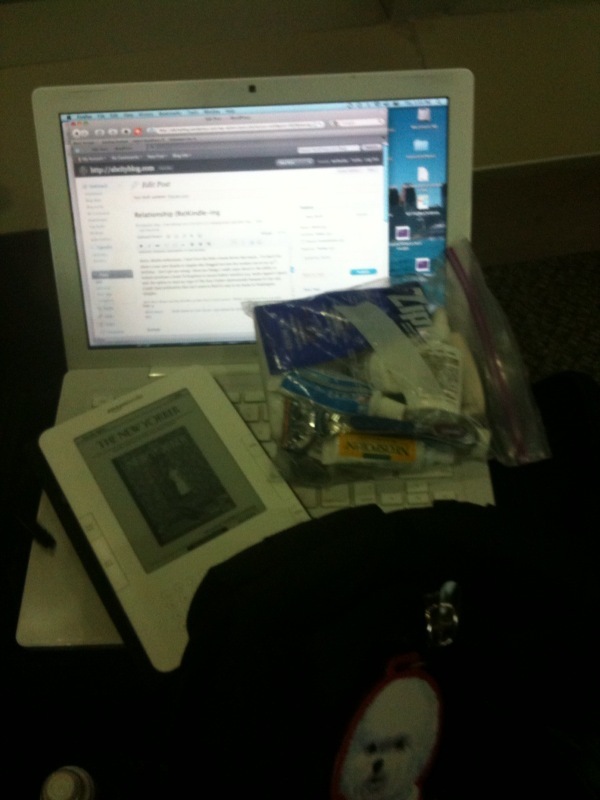 I guess the TSA is conflicted about the Kindle. Join the club.